After a 4-year FBI investigation into the thefts of the "Harry Wright Letters" NYPL President Tony Marx (inset) has given away the donated artifacts to be sold on eBay. Back in the 1950s, Dorothy Seymour Mills held Harry Wright’s letters in her own hands at the New York Public Library’s famous Spalding Baseball Collection. She was conducting research with her late husband, Dr. Harold Seymour, for his Cornell University dissertation and their groundbreaking book Baseball: The Early Years which are both considered the first scholarly works dealing with our National Pastime. The NYPL’s Harry Wright correspondence archive was a key component in the Seymour research because it was a comprehensive day by day record of the man considered the “Father of Professional Baseball” spanning from 1865 to 1894. 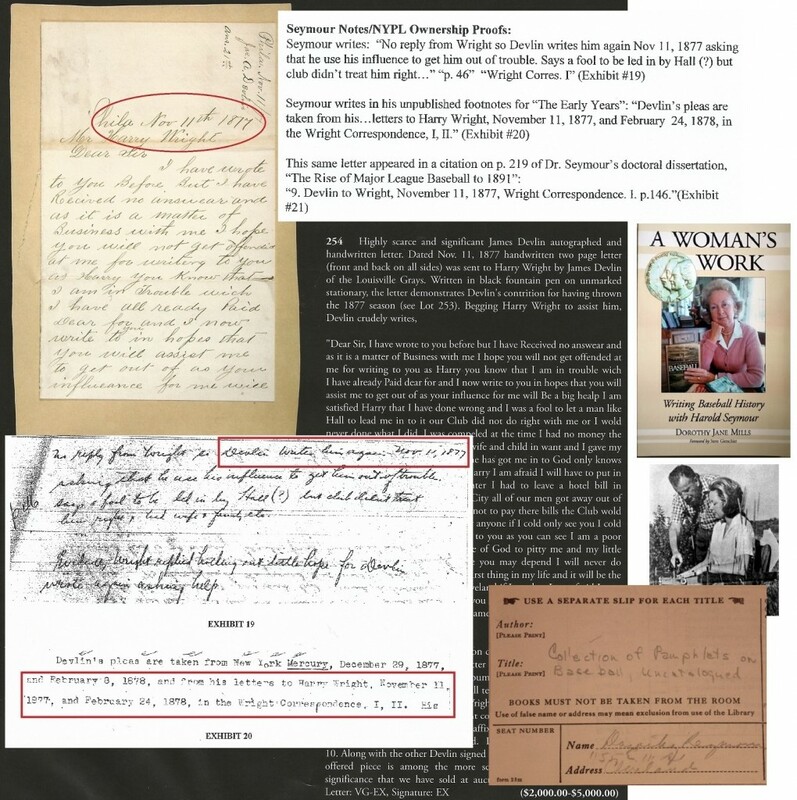 Mills and her husband took copious notes documenting each letter they cited in their work as originating from the pages of four giant scrapbooks of Wright’s letters which were housed in the library’s manuscripts division. A few of the most important documents the Seymour’s discovered in the treasure trove of missives were poignant letters to Wright from pitcher Jim Devlin who had been banished for “throwing games” in one of baseball’s first gambling scandals. The down-and-out Devlin was begging the magnate Wright for any type of work possible to help feed his struggling family. Guzzi knew that her great-grandfather had bequeathed his entire baseball archive to the National League in 1895 and afterwards it became part of the collection of baseball pioneer Albert G. Spalding whose widow donated his entire archive to the NYPL in 1921. Dorothy Seymour Mills knew the letters in the auction were property of the New York Public Library and her citations and research notes housed at Cornell University’s rare and manuscript division proved it unequivocally. At the time Mills identified lot 254 in the Hunt sale as the same Devlin letter she saw at the library and said, “This is proved on page 219 of the doctoral dissertation that I helped my late husband prepare for Cornell University.” Seymour’s footnote identified the exact same letter being offered for sale and based upon her proofs, the Times headline read: Another Clue That Baseball Auction Has Stolen Items. The Hunt Auctions catalog presented a Nov. 11, 1877 letter that was previously cited as NYPL property by Dorothy Seymour Mills and her late husband Dr. Harold Seymour in a Cornell dissertation and on research notes (bottom left) taken at the NYPL in the 1950s. The ownership proofs (top right) were presented to the FBI by Haulsofshame in 2009. The Devlin letters for sure had been stolen from the library and all of the others were suspected to have originated from three of Wright’s correspondence scrapbooks which were documented as missing when the library took an inventory in 1983. 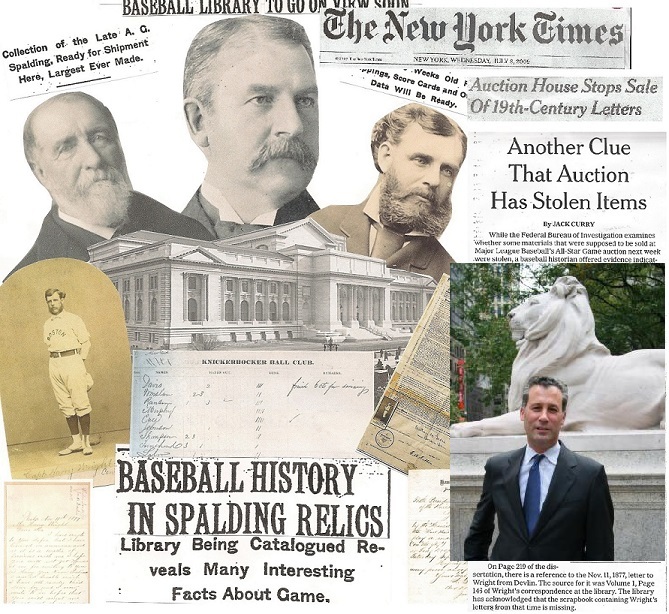 Based upon Mills’ testimony, the New York Times reported that the evidence unearthed caused the auction house to pull the letters from the MLB auction and the NYPL enlisted the aid of the Federal Bureau of Investigation who officially commenced a probe into the alleged Spalding Collection thefts. Mills recounted her experience aiding the FBI on NPR and later wrote an essay about her experience entitled, When Baseball Obsession Goes Too Far, The FBI Steps In. 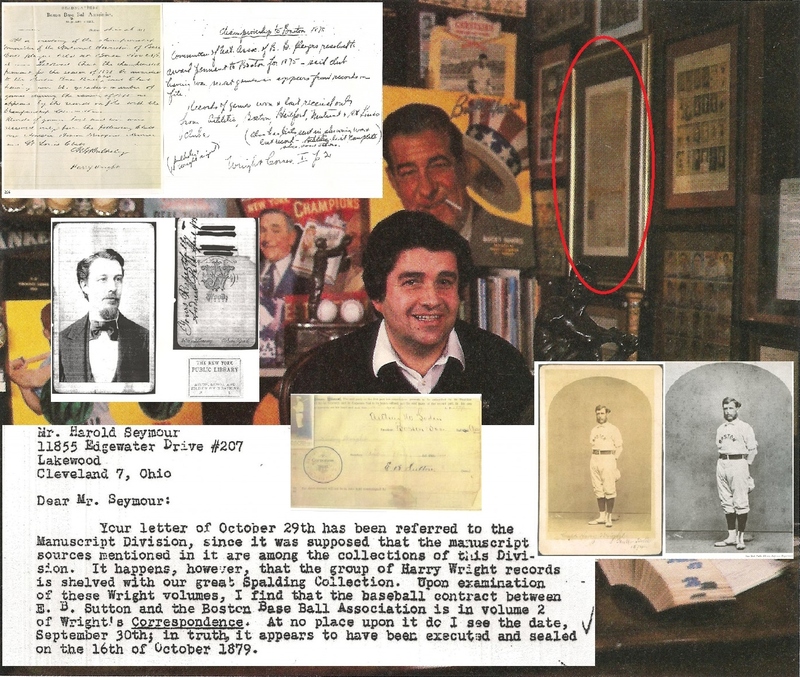 A letter sent by player Dan Casey to Harry Wright in 1889 appeared as the first "Wright Letters" lot in the 2009 Hunt/MLB catalog before it was turned over to the FBI in 2009 as a document suspected to have been stolen from the NYPL Wright scrapbooks. In July, the same letter was posted for sale on eBay in two parts, one of which being Harry Wright's notations written on the letter for his response. The seller ended the auction when contacted by Haulsofshame.com. The cabinet photo of Wright pictured has also been stolen from the NYPL and is currently listed on the NYPL's "Missing List." The FBI was right, as the consignor posted a message on the collector forum Net54 which is owned, operated and moderated by a criminally convicted felon named Leon Rantz Luckey of Allen, Texas. Luckey’s membership includes several collectors who are notorious for buying, selling and showing-off contraband artifacts from institutions and his biggest advertiser, Rob Lifson of Robert Edward Auctions, was actually apprehended stealing items from the Spalding Collection in 1979. In reporting the incident TIME Magazine said the culprit was caught stealing a “cache of smiling infielders.” In recent years Lifson has made several conflicting confessions. The owner of the stolen Wright letters reached out to collectors on Luckey’s forum in late January asking what the value of a Jim Devlin letter to Harry Wright might be. 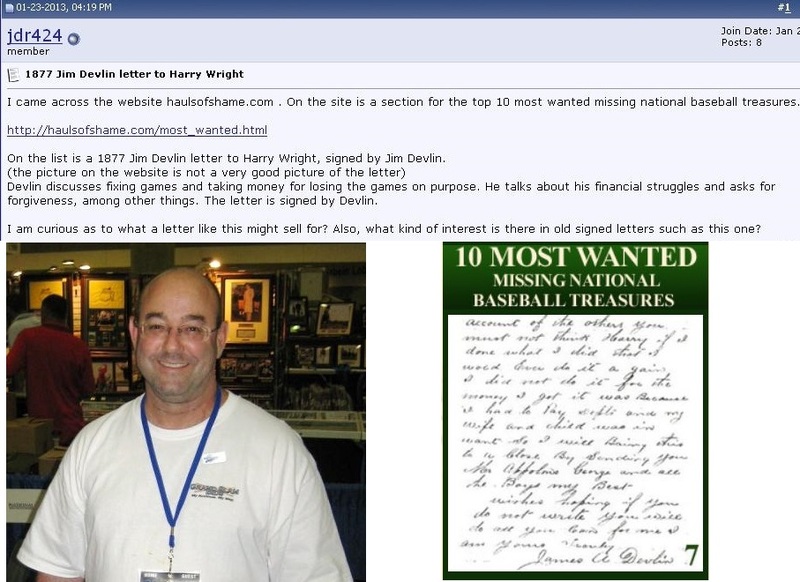 The consignor also posted a link to Haulsofshame.com’s “10 Most Wanted National Baseball Treasures” list and pointed to another Devlin letter written to Wright which was also part of the NYPL collection but not part of the Hunt cache he inherited from a grandparent. A collector responded to the consignor’s message in February and says that he purchased the documents for his personal collection. ”He told me they were returned and his to do whatever he wanted to. The FBI gave him their blessing so I bought them,” he said. The buyer also confirmed that the two Devlin letters were in the consignor’s possession and that he had been “saving up to purchase one of the Devlin letters, too.” The collector told Haulsofshame.com that he knew of the background of the letters and also says that he purchased them to preserve and keep them together should the NYPL ever pursue them on their own. After the "Wright cache of letters" was returned to the Hunt Auctions consignor, he posted this message at the collector forum of ex-felon Leon Luckey (bottom left) looking to price his two Devlin letters for sale. In the post he references the Halper Devlin letter posted on the HOS "10 Most Wanted Missing National Baseball Treasures" list (right). A few months later in 1977, Halper gave writer Peter Golenbock a call and said, “I just picked up something the other day you’d really get a kick out of. 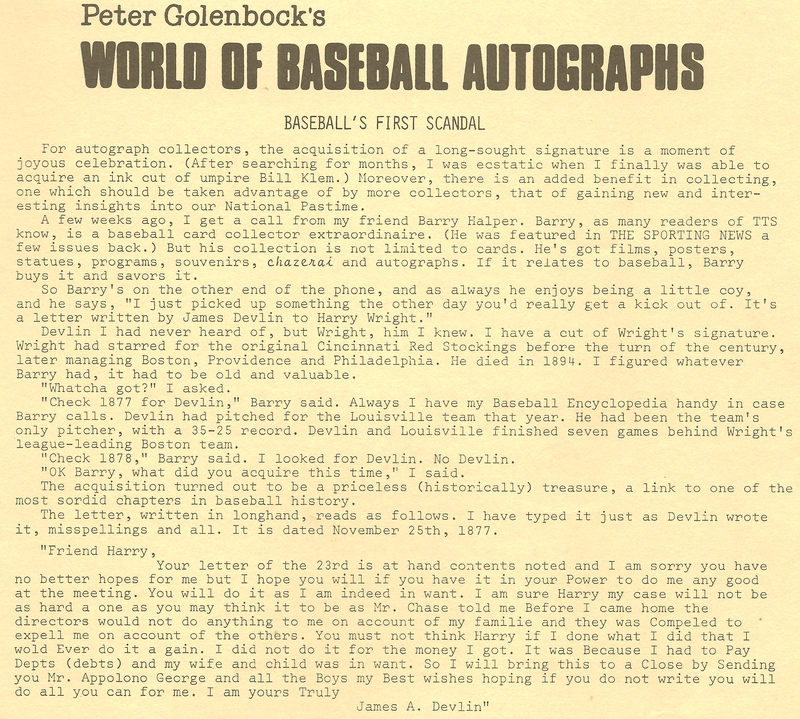 It’s a letter written by James Devlin to Harry Wright.” Golenbock described the letter as a “priceless treasure (historically), a link to one of the most sordid chapters in baseball history” and he published the entire letter dated November 25, 1877, in his “World of Baseball Autographs” column in The Trader Speaks. It should be noted that the surviving Wright Scrapbook No. 2 (which is still at the NYPL) includes two additional letters from Devlin to Wright dated February 24, 1878 and November 14, 1879. In addition to Golenbock, several sources have confirmed that Halper had a sizable archive of Wright letters in the late 1970s and he sold scores of them when he liquidated his collection at Sotheby’s in 1999. Halper’s Devlin letter sold for $8,050. Barry Halper's Devlin letter was featured in an October 1977 issue of "The Trader Speaks" in a column written by author Peter Golenbock. Halper's letter was not cited by the Seymours and was sold at Sotheby's in 1999. Barry Halper sits in his den c.1984 with a stolen 1879 contract signed by Harry Wright hanging on his wall (outlined in red). It is Ezra Sutton's contract and was once part of the NYPL collection as evidenced by the 1953 letter from NYPL to Dr. Seymour about the same contract (bottom left). 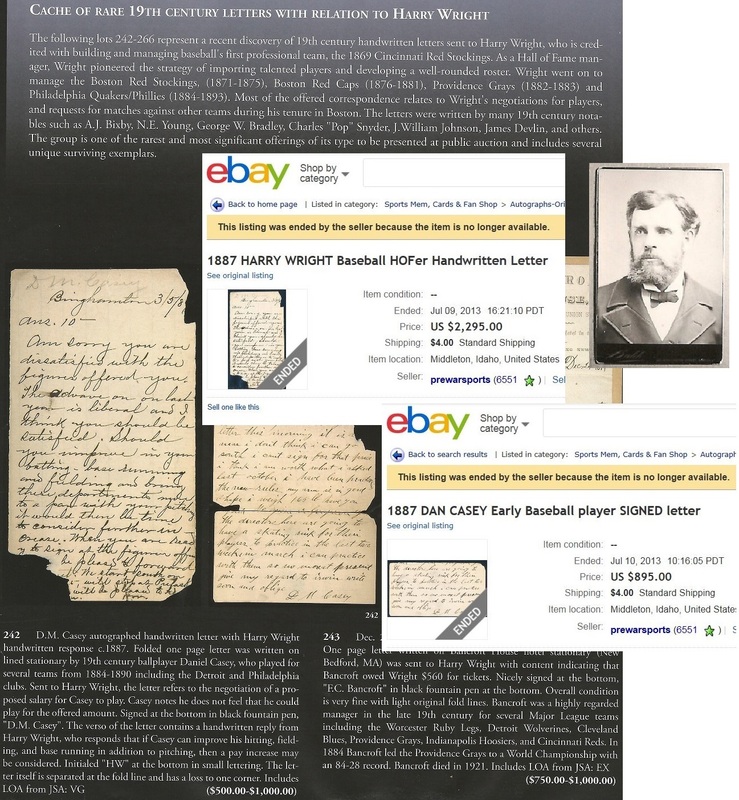 Halper had many other stolen NYPL items including an 1875 letter awarding Boston the pennant documented in the Seymour notes at Cornell (top left); photos of Wright (bottom right) and others with obscured NYPL ownership stamps like the CDV depicted here of Andrew Peck. Many of Halper’s offerings at Sotheby’s have also been confirmed as stolen from the NYPL having been documented verbatim in the Seymour research notes at Cornell. Most notable was a letter to Wright from Morgan Bulkeley awarding Boston the 1875 Pennant and another was an 1879 contract signed by Wright and player Ezra Sutton. Both items were described in detail by the Seymour and Mills and the contract was even documented as being displayed in the NYPL’s main exhibition room in 1922. In addition to documents, Halper also had many rare photographs that exhibited evidence of an NYPL ownership stamp, including several portraits of Harry Wright. Based upon our source’s testimony, Halper likely coordinated the thefts before he purchased a 2% interest in the New York Yankees in 1979 and became one of George Steinbrenner’s limited partners. With evidence suggesting that an MLB owner was involved in the theft and possession of letters donated to organized Baseball and the National League, one would think Bud Selig and MLB Security would conduct their own investigation to aid the NYPL and FBI. Sources indicate, however, that Selig and MLB are reluctant to look into “one of their own” even though Halper also swindled and defrauded MLB and the Baseball Hall of Fame in 1998 when he sold them several million dollars of counterfeit artifacts including what he alleged was “Shoeless” Joe Jackson’s 1919 Black Sox jersey. When the Hunt letters appeared in the 2009 MLB auction MLB spokesman Matt Bourne said Selig was, “eagerly awaiting further information on this matter,” and MLB President Bob DuPuy told the Times he commended Hunt Auctions for “deciding to withdraw merchandise that is not properly documented.” Haulsofshame.com followed up and called MLB’s Matt Bourne to ask if Selig & Co. had conducted their own investigation into Halper, but Bourne was unavailable for comment. Halper’s ownership interest in the Yankee franchise passed to his widow, Sharon Halper, who is currently listed as a Yankee limited partner. Sources indicate that the FBI returned the letters to David Hunt and that the auctioneer passed the documents, many of which are still affixed to c. 1920’s scrapbook paper, to his consignor. Of the forty-five documents returned, over 33% of the auction lots, including the Devlin letters, were proven to be NYPL property based upon the Seymour’s published works and the corresponding research notes at Cornell which quoted verbatim the content of many of the Hunt Auction letters. Lot 253 in the Hunt auction has Devlin describing an auction of his home as he writes, “The sherriff is on the ground and it will be sold Tuesday.” At Cornell, Dr. Harold Seymour’s original NYPL research note also states, “The sherriff is on the ground and it will be sold Tuesday” and identifies his source as a Nov. 2, 1877 letter located on pages “44 and 45″ of “Wright Corres. 1″ at the NYPL. The FBI received a full report documenting these proofs in September of 2009 provided by this writer. Sources indicate neither the FBI nor the NYPL have ever visited Cornell to examine the Seymour Papers on their own. Dorothy Seymour Mills is depicted on SABR's prestigious "Seymour Medal" (far left). When Mills proved letters in the 2009 Hunt sale were NYPL property library CEO David Ferrerio was on his way out having been appointed National Archivist by President Obama (2nd left). Tony Marks (3rd from left) replaced Ferrerio and has been the NYPL CEO during the 4-yr FBI probe which kicked off with the David Hunt (far right) auction and the reporting of Jack Curry (2nd from right) of the Times (now a Yankee/YES broadcaster). Mills told us it would not have been possible without cultural assets like the Spalding Collection. ”I couldn’t have done it without the NYPL. But I wonder if today I would even be able to start such a huge project depending largely upon original manuscript material. I doubt it,” she said. The NYPL displayed its T206 Wagner for All-Star Game week (left) and had All-Star themed apple sculptures at the library entrance (center left). Harry Wright (inset) never envisioned his letter (center right) on ebay; Protesters say the NYPL is being "Looted" by trustees (right). MLB Commish Bud Selig (left) has made no effort to recover Wright's letters; Baseball artifact thieves have even stolen the codicil to Harry Wright's will that instructed the donation of his personal archive to the National League in 1895 (center). This 1874 Warren cabinet photo of Wright is missing from the NYPL collection and documented as NYPL property in a book by Robert Smith (right). The nonsense Guzzi describes is the shady baseball artifact trade that has even extended to the theft of her great-great grandfather’s last will and testament from a Philadelphia courthouse. The codicil to that document bequeathing his letters and archive to the National League in 1895 was also sold by the auctioneer that offered the stolen letters in 2009, David Hunt. Despite being notified that he also sold the stolen codicil to Wright’s will, Hunt has failed to recover and return the document he sold for over $10,000 in the late 1990s. Hunt did not respond to requests for comment. 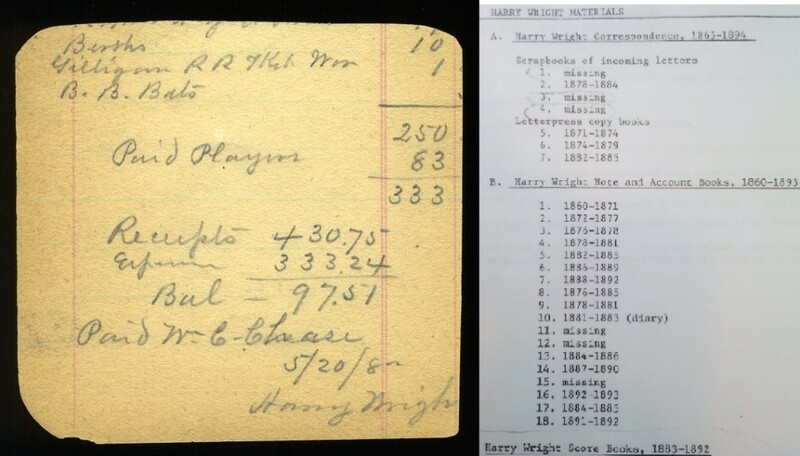 Sources indicate that the library has contacted Huggins & Scott Auctions and identified the Harry Wright letter they are currently offering as NYPL property. The company has not yet responded to that inquiry and auction rep Josh Wulkan has not responded to ours. 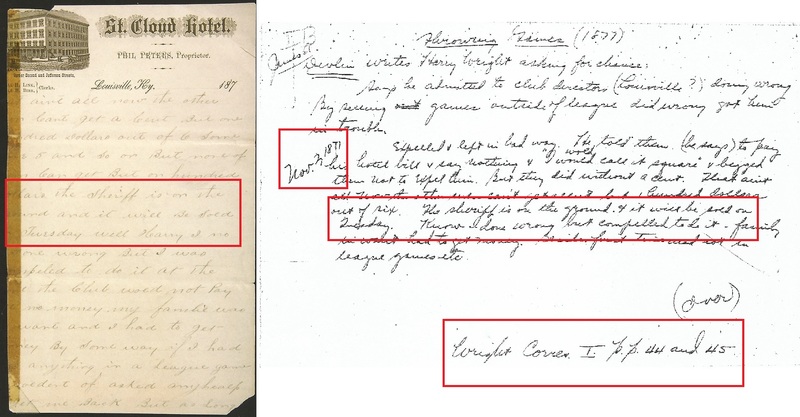 How do the FBI and NYPL explain returning the Devlin letter dated Nov. 2, 1877 from the 2009 Hunt MLB sale (left) in which Devlin writes, "The sheriff is on the ground and it will be sold on Tuesday" (outlined in red, left). Dr. Harold Seymour's handwritten research note at Cornell Univ. quotes from the exact same letter and cites the exact same passage verbatim regarding the "sherriff" from the exact same date and from the "Wright Corres(pondence Scrapbook) 1. p.p. 44 and 45" (all oultlined in red). (Courtesy Cornell Univ. Rare and Manuscript Division). Special Agent Jim Margolin from the FBI’s New York City press office declined comment on the return of the Wright documents but added, “The investigation into the Spalding Collection thefts is still open and active.” But the FBI failed to answer how the US Attorney apparently failed to make a case to keep the letters despite the fact that eight of the twenty-five Hunt lots were verified as NYPL property through the Seymour citations, research notes and the eyewitness testimony of Dorothy Seymour Mills. The remaining lots which were not cited included letters pasted to jagged pages ripped out of scrapbooks and bearing the same dates as the missing Wright scrapbooks. A source familiar with the FBI probe says that there have also been other significant items recovered by the FBI, some said to have been taken via civil forfeiture, and others that were seized and since returned to other owners. An item said to have been recovered was at least one of the missing Harry Wright scrapbooks which was described as mangled with most of its pages and contents removed. Both the NYPL and FBI declined to comment on any additional recoveries. On the heels of the New York Post and Haulsofshame.com reports revealing the FBI’s return of stolen Harry Wright letters to the 2009 Hunt/MLB All-Star Game auction consignor, Premier Auctions of Arizona has offered and sold yet another document that clearly originated from Harry Wright’s personal archive that was donated to the National League in 1895. The document signed by Harry Wright that is being offered by Premier Auctions (right) fits the description of items stolen from NYPLs Spalding Collection and the "Harry Wright Note and Account Books Collection. This page would have originated from volume 16 or 18 as indicated on the NYPL inventory document (above, left). Approximately 6” x 7 ¾” sheet from a ledger written and signed in black fountain pen while Wright was manager of the Philadelphia Phillies in 1892, Nm/Mt signature. The sheet was for a road trip to Baltimore that season and “Statement of Baltimore trip Aug. 12/92” is handwritten by Wright on the reverse. The sheet has three intersecting folds and an irregularly trimmed top edge but is in otherwise remarkable condition given its age. Fantastic example from the posthumously inducted Hall of Famer. JSA Auction LOA. 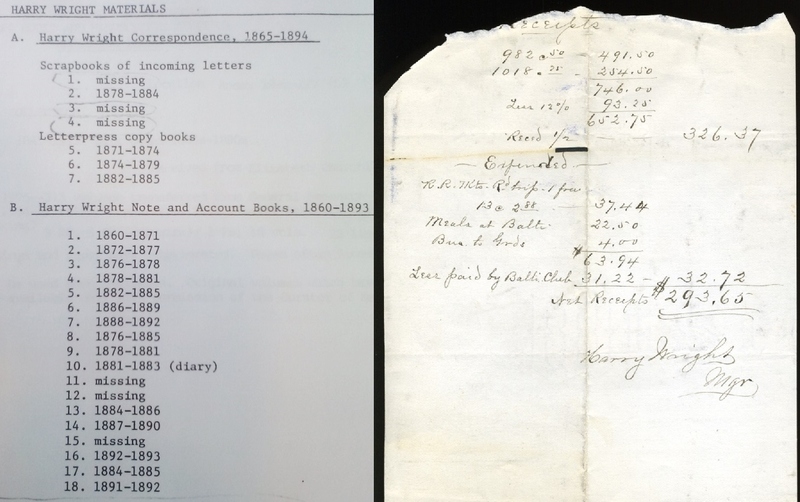 Daryl Brock, author of If I Never Get Back, a celebrated novel that incorporates Harry Wright as a character, utilized the NYPL collection in his research and recalls viewing the first volume of Wright’s “Note and Account Books” which covered the years 1860 through 1871. We showed Brock the stolen page offered by Premier and afterwards he recalled the volume he examined. ”Pages were missing and I have no way of knowing if the one in question now was one of them. The small penciled page sure looks like the same format though,” said Brock. A page dated from 1863 in the NYPL's Wright Account Books archive (left) shows that the page fragment offered by Premier Auctions originated from the same type of ledger notebooks found in the Spalding Collection. Premier never responded to our inquiries about the first offering earlier this year and they failed to respond to our inquiry yesterday. We asked if the two documents were consigned by the same consignor and whether the auction house had any provenance information on the document dated from 1892. Premier list its principals as Jasmani Francis, an appraiser from PBS’ Antiques Roadshow, Walter Cerini and Matthew Palmero who is listed as a former employee of Mike Gutierrez the current consignment director at Heritage Auction Galleries in Dallas, Texas. In our last report historian Dorothy Seymour Mills called for the firing of NYPL President Tony Marx for his failures in recovering the stolen material for the library. The Huggins & Scott Wright letter (center) shares similar characteristics with another Wright letter stolen from NYPL (left). Huggins & Scott's Josh Wulkan (right) refuses to comment on the letter's provenance. Premier sold the Wright document earlier this evening for $2,244, considerably less than what a legitimate document signed by Wright in ink would command. One collector told us he stayed away from the Premier lot because he believed it was stolen from the NYPL. Legitimate documents signed by Wright are very scarce and are worth anywhere from $10,000 to $25,000. There are only a handful of legitimate letters written by Wright in private hands. A Wright letter stolen from the NYPL Harry Wright scrapbooks is also being offered by Huggins & Scott in their current auction. Josh Wulkan of Huggins & Scott has still not responded to inquiries about the provenance of that auction lot. History, historical documents and artefacts are a priceless treasure to a nation. In the hands of an individual, illicitly gained or otherwise, they are utterly worthless. Here in Sheffield we are so proud that one of our Cities ancestral fathers and former player of ‘The Wednesday Cricket Club’ (1829) Samuel Wright should have his descendants play such a high profile role in the development of sport and particularly Cricket and Baseball in the USA. It is so important that the Harry Wright archive of correspondence has been returned to its elected resting place to be shared by all that care to view and/or research and the documents have been removed from the realms of worthless to what are now priceless documents. I and we at The Wednesday Cricket Club here in Sheffield, UK. remain committed to giving and sharing any information we can in terms Samuel Wrights life prior to his departure for the St George Cricket Club. Neville Wright, chairperson, The Wednesday Cricket Club. When it is all said and done who will want to donate anything to a museum if the institution does not act aggressively and with diligence to get it’s stolen, misplaced, or otherwise missing artifacts back? It would just be better for all museums to pay for their contents so that they can act as they please when things are missing and donors families don’t have to feel so violated that their expensive gifts for the public to appreciate are gone without accountability. No matter the outcome to this situation and others similar to this it will always remain a tragedy to everyone. Can we look forward to a future Hauls Of Shame column about all of your legal problems and scrapes with the law? It is so sad to see the families of the original parties donating this archive have to experience this travesty of history. Kudos to the Spalding and Wright clans for coming forward and voicing their opinions and displeasure. The collectors who deal in this shady business should be ashamed of themselves peddling the legacies of the men who built the game. What’s the commissioner got to say about this? Shameful as well. Stealing from Harry Wright is so wrong. I would have loved to add the Wright document to my collection for much more than what it sold for. I not only stayed away from this stolen item, but I stay away from the auction houses (buying & including consignments) to those who deal in stolen material. After being sent the cease and desist order, Lifson’s auction house has since become one of Luckey’s regular advertisers on Net54, where other members also freely post images of stolen NYPL items in their possession. One collector named Ken Wirt regularly posts images of a rare cabinet photo of baseball pioneer Alexander Joy Cartwright, that is listed on the NYPLs “Missing List.” The card was purchased in Lifson’s 2007 auction of the remainder of Barry Halper’s collection and the exact same photo is credited in numerous baseball reference books to the NYPLs Spalding Collection. In his auction description, Lifson even described the photo as “the only traditional cabinet card photo of Cartwright that we have ever seen or heard of.” He added, “It is possible it is unique.” Another Net54 member, Corey Shanus, publicly displayed several rare letters stolen from the NYPL Knickerbocker Club Scrapbooks in a coffee-table baseball book published by the Smithsonian and, yet another member, Barry Sloate, has been linked to other stolen NYPL artifacts including additional Knickerbocker documents, score-sheets from the 1850s and a rare pamphlet from the 1852 Eagle Ball Club of New York City. The authentic but stolen Harry Wright letter appearing in the Huggins & Scott auction in the same lot as a legitimate and authentic George Wright letter sold for only $3,000. A George Wright letter alone should sell for that. A legitimate Harry Wright letter is worth far more than that and is very scarce (not as scarce, though, if you include in the population the HW letters stolen from NYPL) The NYPL never responded to inquiries regarding their efforts to recover the letter from the auction house. It would be swell if my pal Bud Selig bought these and returned them to the NY Public Library. Peter, I am looking forward to your book on this subject. I hope it sells widely.